Speedgrader is a grading tool where instructors can leave inline comments, grades, and feedback for student’s work all on one screen. Speedgrader can be used with assignments, graded discussions, and quizzes. Some file types can be marked up for feedback directly within the submission. Instructors can also provide feedback to your students with text, file attachments, or media comments. Zoom: Screenshot of speedgrader with numbers associated with each component of the speedgrader tool. 1. Student submission preview. 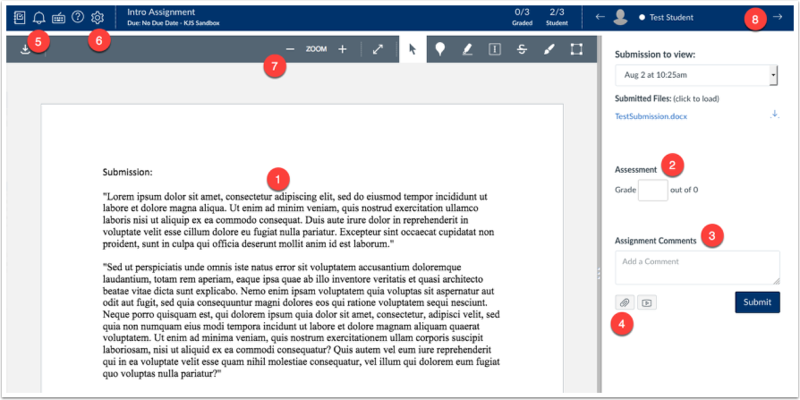 Preview .doc, .docx, .ppt, .pptx, and .pdf submissions using Crocodoc. 2. Area to assign grade (either percentages or points). 3. View comments created by you or the student about the assignment. 4. Create text, video, and/or audio feedback for the student. 5. Instructors can mute assignments to allow you to complete all grading prior to the students seeing their scores. 6. To grade anonymously, instructors can hide the student’s names. 7. Inline commenting usingDocViewer allows you to leave feedback directly within the preview of the document without having to download the document onto your computer. 8. You can easily flip through the submissions by using the arrow keys next to the student’s names.